American Water Spaniels are generally healthy but are sometimes prone to skin problems. It is important that when contacting a American Water Spaniel breeder that you express health concern issues and ask the breeder what they are doing in order to help mimimize them. Please don't purchase your American Water Spaniel from a petstore which commonly are known to support American Water Spaniel puppy mills. Doing so only promotes inproper breeding ethics and promotes current American Water Spaniel health issues. The AKC, UKC, FCI, CKC, SKC, WWKC, FIC registries recognize the American Water Spaniel breed standard. 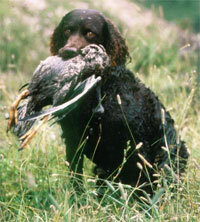 Country of Origin: Developed in the late 1800's and known originally as the Brown Water Spaniel. Almost extinct by the 20th century, it was promoted by Dr. F.J. Pfiefer who essentially saved the breed by establishing a breed club and a written standard. Character: Sensitive, timid, loyal and intelligent. Can be loud. Temperment: Good with family dogs, but sometimes aggressive towards outsiders. Gentle with children and other pets. Coat: Hair is long and oily. Colors can be liver, brown, or dark chocolate. Care Brush coat weekly. The hair around the feet and topknot can be clipped. Check ears regularly. Comments: Good family pet. Can be used in therapy programs. Water dog. Very gentle and friendly disposition.